Born on this day in 1807, Henry Wadsworth Longfellow wrote classic American poems; The Song of Hiawatha, Evangeline and most famously, Paul Revere’s Ride. 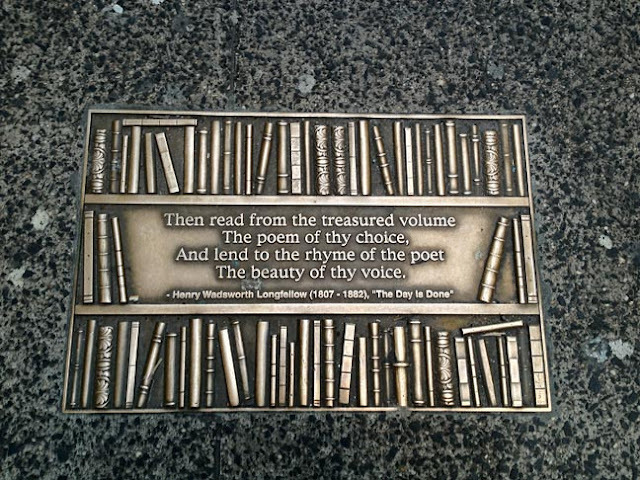 The verse on Library Walk is from, The Day is Done, the proem to an 1844 anthology of poems collected by Longfellow in The Waif. In 1874, his poem, The Hanging of the Crane, was sold to the New York Ledger for $3000. At the time it was the highest price ever paid for a poem. Whether it be a birth day, anniversary or publication date of a seminal work, the Bar None Group will revisit these 40+ quotations from time to time — quotations that inspire one to write, read, explore and embrace literature. We last visited Gwendolyn Brooks. Longfellow put together an incredible body of work that still resonates today.